Here in northern Virginia part of the Washington, DC metro area—near where REVITALIZATION is based in Arlington—the Vienna Town Council has (finally) started creating a strategic plan. A major portion of that plan is focused on revitalizing the town’s economy, which has long been sabotaged by automobile-obsessed urban planners who seemed to be unaware that people ever needed to walk anywhere. The strategic plan’s goal is for Vienna to become a “location of choice for unique, independent businesses that add to the town’s charm, attract visitors as well as residents and collectively serve to establish the town as a destination.” The timing is auspicious, as the nearby Tysons area is probably the nation’s (maybe the world’s) largest transit-oriented urban redevelopment project. Vienna has tried and failed to revitalize several times before. The bad planning and design were a major factor in those failures, as was the lack of an actual strategic revitalization process. Both of those factors are the norm in American cities, which explains the dismal success rate of revitalization efforts in this country (and most others). That grand project has been documented several times here in REVITALIZATION over the years, with the first being here in the February 15, 2016 issue. Some new businesses arrived as a result of those initiatives, but mostly the same national chains that have rendered so many other communities sterile and uninteresting. One of the hardest-hit areas is the western end of Maple Avenue, which suffers from the visual blight blight of empty storefronts and the corpse of the recently-burned (by vandalism) Marco Polo restaurant. Update the town’s zoning codes is a major part of the town’s strategy, to facilitate economic revitalization. Enhance streetscapes to encourage walkability. To reduce vacant storefronts, the plan recommends providing a link on the town’s website to reveal current vacant properties. This would help attract local entrepreneurs, making them less dependent on national chains. Home-grown revitalization is usually far more effective. The also plan to make those vacant spaces available for pop-up artistic uses and short-term retail usage. The plan also says that the current Town Green could be renovated into more of a social hub for Vienna, with activation of the square via food trucks. Additional free events: dances, dance lessons, senior events. Lynne Coan, communications and marketing manager for the Town of Vienna, said the strategic plan is still a work in progress, and that the Town Council is scheduled to review a draft of the plan in the spring. She also said that said the council has now removed the pedestrian bridges and the digital information board from the strategic plan. 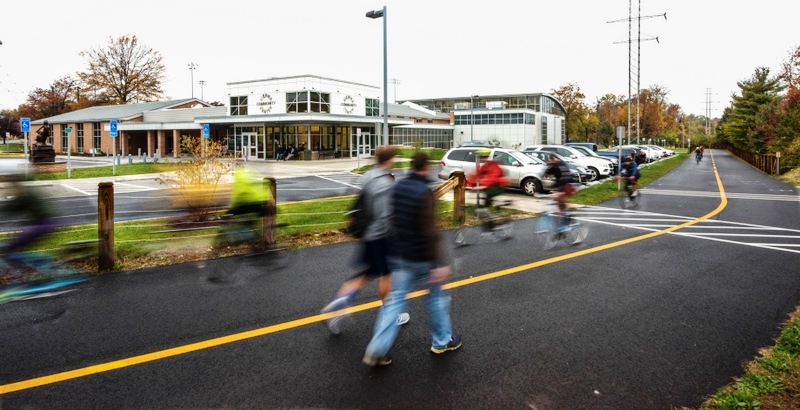 Photo of new pedestrian/bike trail and community center courtesy of the Town of Vienna. See full draft of Vienna strategic plan (PDF).